Tindale Dentists are passionate about children’s dental care. All our dentists are experienced and capable in providing comprehensive care for our younger patients. It is our strong belief that habits developed in childhood establish a pattern for the rest of a person’s life. Our goal at Tindale Dental is to give your child a positive experience so visiting the Dentist is a familiar, safe and friendly environment. We believe that dental care at an early age is important for of a number of reasons including that these visits provide an opportunity to address early preventative issues that are vital to healthy teeth and a pleasing smile. Ideally, children should visit a dentist with their family members for their regular check-ups from as early as possible. Initially, they will maybe take a ride in the chair or count their teeth with the dentist. Early visits can also help establish a healthy relationship between your child and his/her dentist and establish a true dental home for your child. Then, from around the age of 3-4 years old they will be comfortable and commence proper dental check-ups. At this visit, your dentist can identify and diagnose those problems that can be detected early, treated early, or completely avoided all together. What should I tell my child before our visit? 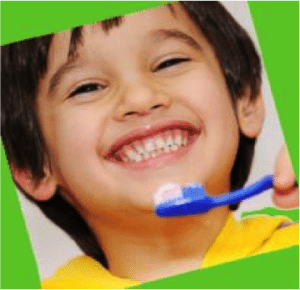 At Tindale Dental Centre our goal is to make our patients’ dental visit a positive and fun experience that will encourage your children to value their own dental health for a lifetime. A visit to the dentist should never be cause for anxiety; please talk about your child’s visit in the same way you would discuss a new and fun experience. Try to keep your child’s attitude positive, even if you are anxious for them. We truly believe in Healthy Smiles . . . Happy Kids! How often should my children see a dentist? For most children, it is recommended to have a dental check-up and cleaning every 6 months. However, every child’s dental health needs are different, so some children will need to be seen more frequently. How often do I brush and floss my child’s teeth? Proper oral hygiene (brushing and flossing) are VERY IMPORTANT to keeping your child’s smile healthy and free of decay. 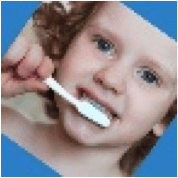 Brushing should be done as soon as your child has teeth. For infants, brushing may take less than 30 seconds depending on how many teeth are in the mouth, but for children with a full smile, brush for at least 2 minutes twice a day, in the morning and in the evening before bed time. REMEMBER: HEALTHY SMILES . . . HAPPY KIDS!